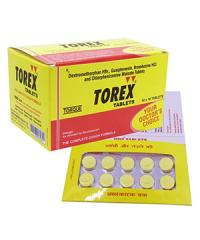 Torex tablet is an effective combination that works to relieve cough miseries. It contains combination of Chlorpheniramine which is anti-histaminic, Dextromethorphan which is an antitussive drug, Guaiphenesin which is an expectorant and Bromhexine which is a mucolytic agent. 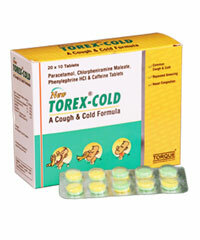 Torex Cold Tablets help in the treatment of nasal and sinus congestion, sinus pain and headache, allergic symptoms of the nose or throat due to upper respiratory tract allergies.